Whether you have fresh watermelon or your favorite watermelon liqueur, there is a fantastic cocktail recipe waiting for you. Melon cocktails are fun, delicious, and perfect for the hot days of summer. They're very refreshing and include variations on mojitos, margaritas, martinis, and spiked lemonade. Also, if you have leftover fruit from your picnic, these are the perfect excuse to use it up. Fresh watermelon calls for a super fresh cocktail and it doesn't get much fresher than the mojito. It's one of the best drinks of summer and it's just a little better with some juicy melon. The Independence Day mojito is very simple. 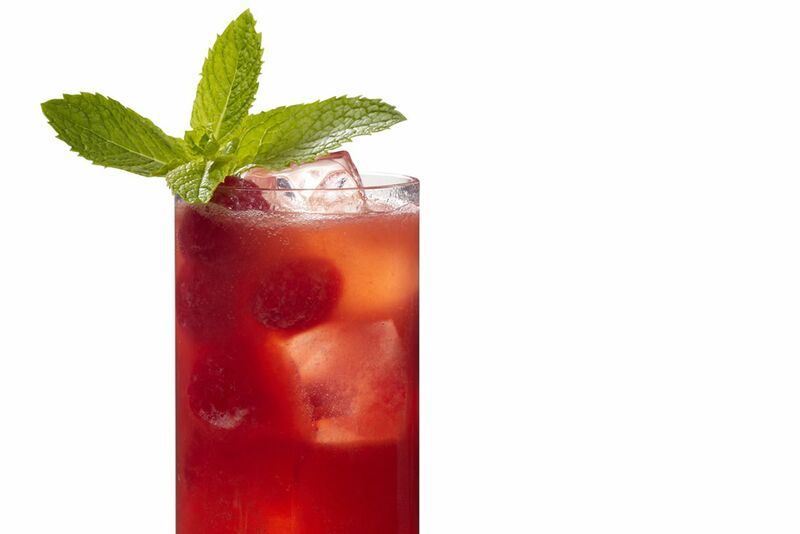 The only real change from the original mojito recipe is the addition of watermelon cubes and raspberries. Those are added to the muddle and the combination of fresh mint with the juices is absolutely perfect. The margarita is another ideal venue for the sweet taste of melons. While you can use a melon liqueur for a quick melon margarita, there's another recipe you'll want to try for fresh melons. This watermelon margarita is a great way to use up an over-sized melon. You'll simply need a blender and the typical margarita ingredients of tequila, triple sec and lime juice. Blend up a round or two and your melon stash will be gone before you know it. The martini is also a perfect venue for sweet watermelon. For this recipe, you'll need fresh juice. You can make it from your blender or go the low-tech route and mash it with your trusty muddler. However you get the juice, you'll find that it's the perfect base for this simple vodka martini. Choose a great vodka and be sure to use fresh lime and homemade simple syrup. Shake it all up and you will have the freshest Watermelon Martinis possible. One of the best flavor pairings for fresh melon of any variety is ​the cucumber. They're two ingredients that celebrate the fresh produce of summer and they could even come out of your own garden. To show off the perfection of this pairing, mix up the watermelon cucumber cooler. Its base is the floral Aviation American Gin, it uses only the freshest fruits, and it's finished off with sparkling soda. It's perfect for an afternoon on the patio. There's a surprising ingredient inside this intriguing spiked lemonade recipe. Before you judge it, give it a taste because it's one of those amazing flavor pairings you probably never thought of. The summertime fruit punch lemonade is a vodka cocktail with a sparkling pink lemonade, so it's very refreshing. It also includes fresh watermelon which is paired with fresh parsley. It's a unique recipe and an easy one to transform into a punch so you can share the taste adventure. When you feel like something equally unique, the peppermelon recipe is another great choice. It's a fruity gin martini with a spicy twist that comes from an unusual DIY ingredient. The recipe features the impressive botanicals of Bluecoat Gin along with fresh watermelon and lemon juices. Yet, it is the homemade black pepper honey syrup that brings this drink into a new realm of interesting. It's definitely worth trying. Break out the blender, because it's time to combine three great elements of summer into a boozy smoothie. This recipe is fun and sure to be a crowd pleaser at the neighborhood barbecue. The frozen watermelon coconut mojito is exactly what it sounds like. It blends fresh watermelon and mint with coconut rum and milk to create a creamy cocktail. You'll catch that refreshing coolness of the mint in the background of every sip, so it's quite fascinating. When you're really in the mood to play with your watermelon, grab a bottle of vodka. Fruit and liquor in hand, you now have two fun options. One is a simple watermelon-infused vodka, which is ideal if your melon is already cut into pieces. The other is a drunken watermelon and it requires a whole watermelon. For this one, you'll actually be soaking the fruit with vodka, creating a fun treat for summer parties. While you may be most familiar with the bright green melon liqueurs like Midori, watermelon liqueurs are available as well. Brands like Bols offer this option and it is a fun addition to any home bar stock. While there are many possibilities with this sweet, red liqueur, one of our favorites is the watermelon cosmo. It is everything you love about the original cosmopolitan cocktail, complete with cranberry and vodka, but the watermelon is a welcomed twist. 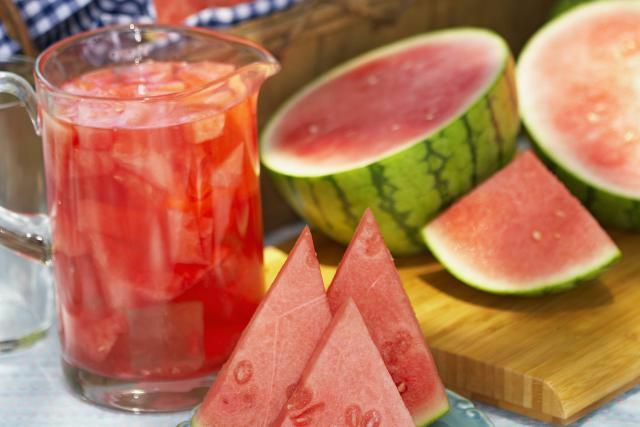 We cannot help but share a recipe that features Watermelon Pucker. Like all of DeKuyper's "Pucker" schnapps, it's a little sweeter than most. However, it is a whole lot of fun in cocktails. And what could be more fun than a gummi bear margarita? This is one of those candy-inspired cocktails that bring out the kid in every adult. It's a simple margarita recipe that's shaken and served on the rocks, just be sure to include the gummi bear garnish.